I used the `twig wreath´ stamp set and die plus the `bold and beautiful sentiments´ from PI. My Sentiment was heat embossed on the `mix and mat confetti´ die and then run through my big shot with en embossing folder, all from PI. All of my supplies were lying around in my craft room - completely unused in my craft room. Made another card for PI`s anniversary - this time the challenge was to use one of the color combos from the designteam members. I embossed my white cardstock and then stamped a woodgrain border from PI at both ends in hawaian shores ink. Then I adhered my journal card, stamped the `fabulous friend´ with unicorn white ink (it`s a sentiment from paper smooches) and put a strip of washi tape on the upper end of my journal card. Hi everyone. I´m joining this day`s challenge to use JUST dies and no stamps. To use only dies also gave me the opportunity to use some of those things I like to buy and then get stuck into one of my closets to VANISH there for the next couple of years. LOL. Like this little butterfly I´ve had in my stash for quite some time. Paired it with a cover plate from PI (cover plate scallops die), a GORGEOUS one, I tell ya! The word `hello´ is from PI `thick and thin hello´ . 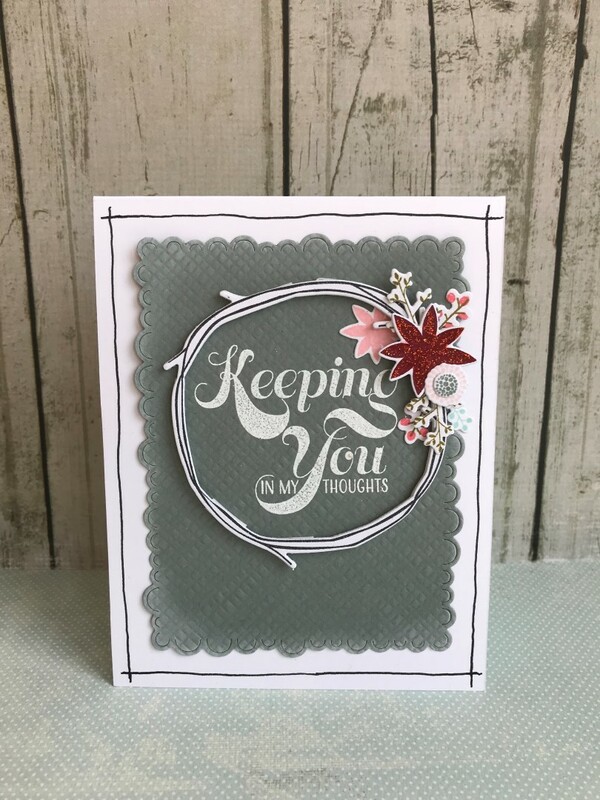 Used one of my all time favorites `bitty bouquet´ from PI and paired it with a sentiment from paper smooches. Finally participating in another MIM. 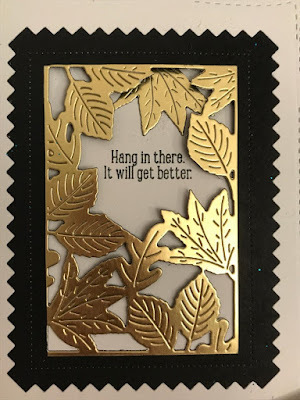 When I watched Dawn create her window card I started to think about a concept for my card when my eyes fell on one of the many dies I have never used before. The `pinked edge die´ in this case. 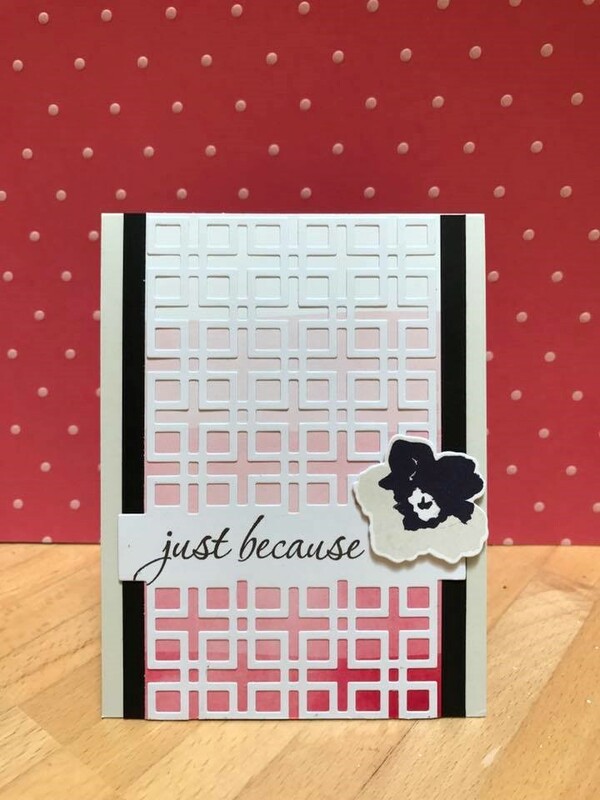 So at first I die cut the pinked window out of my card base, then covered the back with black cardstock. Next I cut out a rectangle (out of a luxe gold adhesive sheet). This rectangle had the same size as the leafy rectangle piece. I stuck it onto the middle of the black cardstock - then die cut the leaves. Next I cut away 2 leaves so I had room for my sentiment (from `a little inspiration´) to stamp. I wasn`t happy with the open space I had created yet didn`t want to change the `frame´. So I decided to stick one of the leaves above the sentiment to give it a more complete look. Usually we`re on holiday and now I am too busy with my work. But I stole some time to make at least something - and all went wrong. 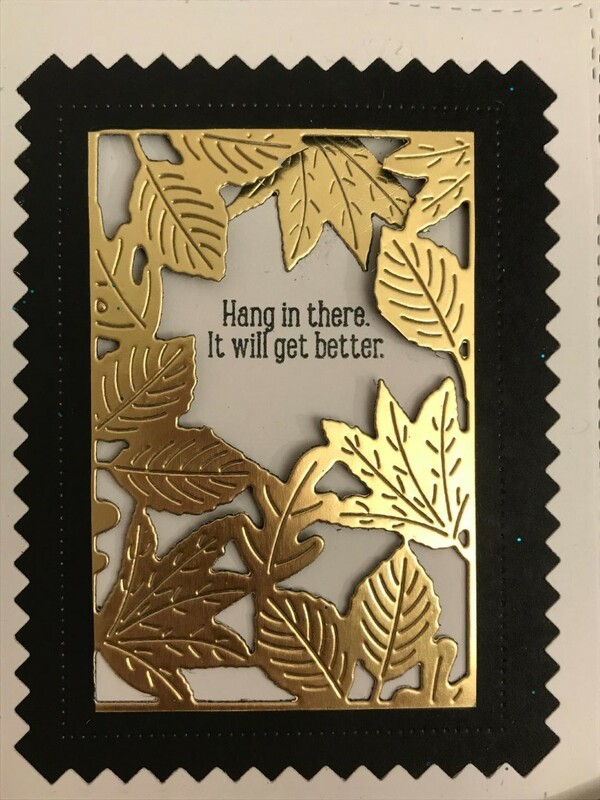 I made a card using `stylized autumn´ and had decided to use the branch for the iron technique. BUT instead of making it iron I used some gold glitter embossing powder cause I thought it would look nice. And - so it did - BUT the theme is `Iron´! So I quickly made a second card to fit the theme, not happy with it but hey - it`s IRON. SIGH again. 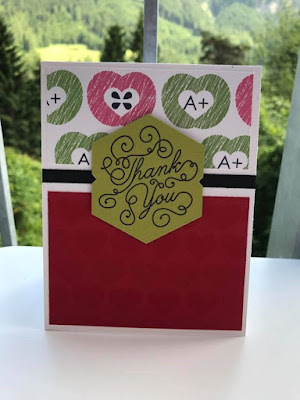 Did you see this awesome, AWESOME card of Nichole`s? I decided to use her gorgeous card as an inspiration for me for this week`s create along with us. Stunning card, is it not???? Ooooh, I could swoon over this one for hours!!!! 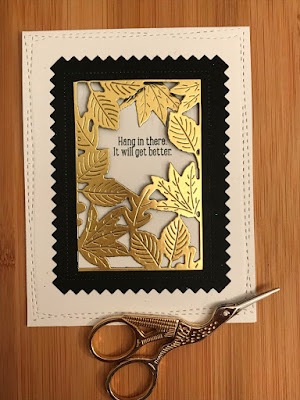 I thought, I would create a frame and use some sort of die cuts for the inside, finished with a sentiment across the card. Well .... I do like the result of my card but I´m not sure if one can see that the above card was used as a guide. Anyways. I used one of my favorite dies from PI, the mighty oak. Lovely die. I die cut some of the leaves double and popped some of them up with foam, the sentiment ist from `simple sentiments´. I´ll be honest - I was too lazy to do some monochrome stamping. Instead I chose to use one of my most favorite cover up dies from PI which is the Scallops Die. Such a great one!!! The die cut is meant for the ´monochrome´ part and my butterfly is intended to be the `color´ pop. 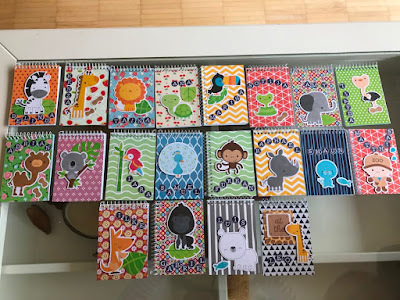 Unfortunately we don`t have big scrapbook and crafting stores where I live ....so whenever I see something (mostly stickers and such) I immediately buy it to incorporate it into my cards. This time I saw some folded butterflies and thought that they were cute. I was really happy to see this week`s challenge as I wanted to create such a slider card for some time. So I took the opportunity to give it a go! I used two older stamp sets from PI `Hello Foxy´ and `Wonderful Words: Together´. I have to admit .... that I (kind of) cheated .... well not really cheated cheated but it felt like so a bit when I started creating my card. I think it was SO clever how Lizzie created her slider card! Out of stuff she already had - that`s how it`s done! I started with a top folded kraft cardstock and impressed it with my woodgrain Impression plate. Then I sponged the edges with white ink to make the card pop a little bit more and splattered some white ink onto my base. I purchased their new Releases stamp set `Miso happy´ cause I liked the cute pandas so much. Gotta create a lot more with this stamp set, that`s for sure. We have store here in my town and it has a VERY SMALL section of goodies for packaging, really Nothing special for crafters/cardmakers, but hey .... you gotta work with what you have, right? They sold tiny butterflies and I thought that I could use them to make some 4x4 Cards. That`s pretty much what I did PLUS I used my Oxide Inks with the smooshing technique to create Backgrounds. Really really like the results, I have to say. When I´m super busy and don`t seem to have quite the time for making a card I often grab some pieces that are lying around in my craft room (oh - and there are QUITE some pieces there lol) and Combine them to make quick card anyways. That`s exactly what I did here - and - I have to say: I LOVE this card!!! The only `real work´ here was to emboss the white paper panel with a woodgrain embossing folder. Everything else was super easy, just combined what I liked. A piece of chipboard with adhesive on the back, a golden precut doily (I L O V E those doilies!!!!) and a tiny bit of patterned paper. Voila! Pantone Chips inspired Cards. What a fun idea! Sorry for the bad pics - I just made quick pictures on my work desk. I used the branch from ´latin motifs´ and heat embossed it with white embossing powder, then die cut it. Sentiment is from that set too! For a bit of interest I made some lines with my stylo, I hardly ever do that and it`s SO pretty (I think). Our year at school is neary over, time to get those theacher cards ready for givin them away. Currently I´m busy with creating a holiday planner for my daughter. I bought a few chipboard shapes and some of them are just too big to find their way into the planner. So - another reason to use them on a Card. 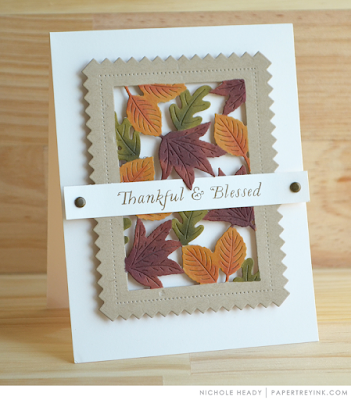 Also used one of my favorite embossing Folders, think it`s from Ranger. Gorgeous folder, really! 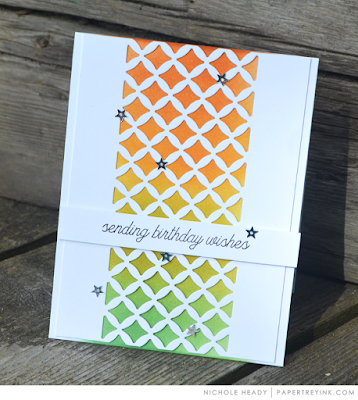 I made a card today and I used one of Nichole Heady`s cards as a guide. I really liked the new mix and mat die, she used and remembered that I have a similar die in my stash. It`s not from PI but I used the brushed blooms stamp set from them - one of my all time favorites!!! As I was a bit lazy today I decided to use some watercolor patterned paper for my backgroud. When I went groceries shopping the other day I saw these cute little notebooks. 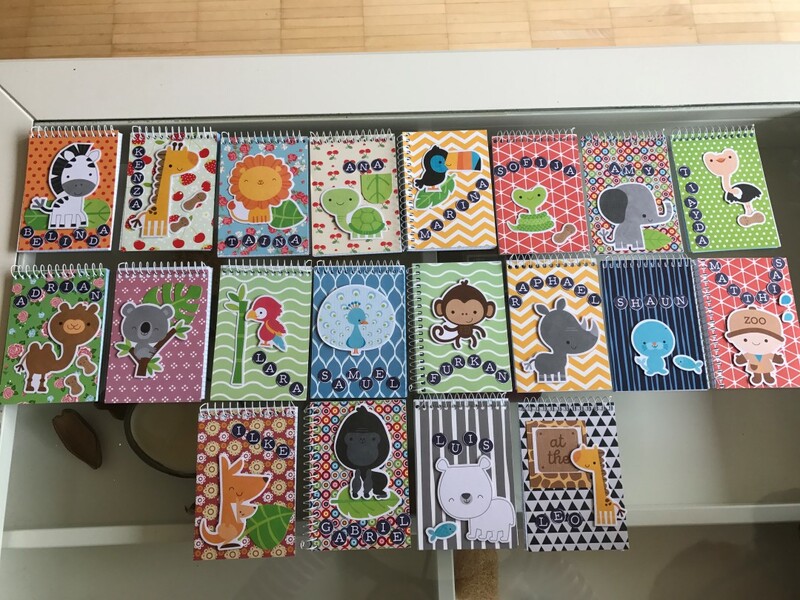 They were sold in packages of 4 for just 2€ and had super fun patterns on their covers. I immediately thought that these would make great gifts for my daughter`s friends and so I bought 5 packages. Then I stamped a bunch of letters (Clearly Besottd `typed alphabet´) for the children`s names, punched them out and created the various names. I think it`s from one of PI`s previous challenge. Nichole wanted us to use our inks to create a Background and then spritz it with water. I REALLY did my best to save this card! Embossed the cardbase, used patterned paper behind my sponged piece, added washi tape. Nothing really helped. Totally disliked my card. I used the same colors on my Background but kept it more simple as the whole sponging thing is really busy allready. I like this card better than the first one but STILL wasn`t super happy about it. So I made another one. The softer sponging here is much more to my liking and the sequin is a nice bling also, don`t you think? Thank you very much for visiting and good night! 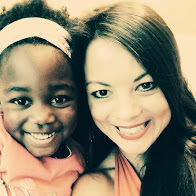 I`m trying to participate as much as possible in the PI celebration but it`s hard for me because I have 2 little ones at home and my focus is on them of course. That said it still feels as if I´m cheating a bit on this one but all I could do was to create a card and envelope as fast as possible while my youngest was taking his nap. I recently purchased a bunch of beautiful - I tell ya - gorgeous butterflies in a local store with a small crafting section and I had to use those. I tell you, it doesn`t look like something special on the picture but in real life it`s really pretty! das wunderschöne Maikit ist da! Ursprünglich bin ich zufällig in dieses Hobby hineingerutscht, denn ich wollte ein Fotoalbum für meine Tochter machen. Ich bin noch weit davon entfernt, so gut zu sein, wie ich es mir wünsche - ABER - es macht großen Spaß und noch viel größeren, wenn ich sehe, daß sich andere über die Karten freuen, die ich verschicke! Gerade in Zeiten wie diesen, in denen eine email oder eine SMS schnell verschickt wird, gewinnen mit Liebe ausgesuchte Karten wieder mehr an Bedeutung. Und wer freut sich nicht über `richtige Post´ im Postkasten?